A former researcher at the University of Pittsburgh inflated the number of mice used in his experiments, and faked data in a number of images in a paper reporting the results, according to the Office of Research Integrity (ORI). 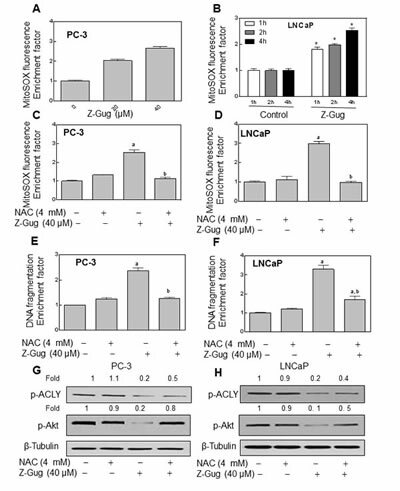 Figure 6: Anticancer effect of Z-Gug is mediated by mitochondrial ROS generation. Flow cytometric measurement of MitoSOX Red fluorescence in PC-3 (A) and LNCaP (B) cells treated with DMSO (control) or 20 or 40 µM Z-Gug. Results shown are mean ± S.E. total sample size is n = 4 per group. *significantly different (P<0.05) between the indicated groups by one-way ANOVA followed by Dunnett’s test. 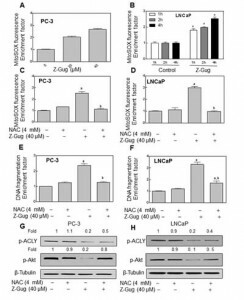 Effect of NAC on Z-Gug (40 µM 4 h for flow cytometric measurement of MitoSOX Red fluorescence, and 24 h for cytoplasmic histone-associated DNA fragmentation in PC-3 (C and E) and LNCaP (D and F) cells treated with or without 2 h pretreatment of 4 mM NAC. The detailed treatment information was described in the section of Methods. For C to F, Columns, mean of three determinations; bars, SE. *Significantly different (aP < 0.05) compared with DMSO-treated control and (bP < 0.05) compared with Z-Gug-treated group by one-way ANOVA followed by Dunnett’s test. Similar results were observed in two independent experiments. Representative data from a single experiment are shown. Immunoblotting analysis of S473phospho-Akt was performed using lysates from the PC-3 (G) and LNCaP (H) cells treated with or without 2 h pretreatment of 4 mM NAC. The blot was stripped and reprobed with-anti-β-tubulin antibody to ensure equal protein loading. The numbers on top of the immunoreactive bands represent change in levels relative to DMSO-treated control. Immunoblotting for each protein was performed at least twice using independently prepared lysates. According to the ORI, Xiao’s misdeeds went beyond Figure 6G. He also reported that 10 mice per group were used in experiments, when he only had data for four. And he faked figures 1D, 4C, 4D, 5C, 5D, 6H, S2B, and S3B. Xiao agreed to have his research supervised for three years, and to not serve on any NIH peer review committees for that period of time. …the University conducted an inquiry, self-reported the matter, provided the information to the ORI and cooperated with their inquiry. Maybe it’s just me, but it seems like if someone does this it should be the end of their career, not “have his research supervised for three years, and to not serve on any NIH peer review committees for that period of time,” which sounds more like getting your hand slapped, when an expulsion is what is truly needed. I certainly agree. I believe that it should start at ten years debarment from ANY Federal grant program and go up from there. Three years is a slap on the wrist. If they are here on a visa, they should be deported as undesirables. If I recall correctly, Stapel claimed that once he had done his first fake, it became easy. So what is the outcome of doing your first fake and being caught? Does the individual then learn that they should fake more cleverly? In this case @Chemguy is right, because the community will suffer over a long time. Or does the individual change and realise that though faking is easy, it isn’t science? There are 6 authors. So, the remaining 5 were totally clueless about the data, or research, or fakery? Is it possible for lone wolves to work in packs? My attention was recently caught by several similar reports and subsequent sarcastic comments on the apparent kindness of sanctions. Aren’t we yielding an effect opposite to preservation of research integrity with the advertisement made on these mild decisions to “punish” dishonest scientists ? When it is more and more publicly known that even if you’re caught with the hands in the bag all you risk is to have to accept (what is the alternative if you don’t btw?) a supervision and to stay away from NIH reviewing committees for 3 years, won’t we create data-faking vocations? or have up-to-date honest but frustrated/under pressure scientist to cross the line. I’m very far to be fond of destructive justice decisions like getting imediatetely fired and also understand the ORI has to work within a certain frame and to be lenient in such cases of spontaneous acceptation of sanctions. But seriously: would it be that impossible to add a fine to convert into days of community work, just to make fraud a little less attractive and have in a way a part of the wasted money returned to taxpayers? LoL. I wonder. What does it take to get something more than the three years supervision and no peer review committees punishment. Seems as if the ORI shouldn’t even bother wasting their time “investigating” fraudulent papers as nothing really is done about it. ORI does not have the authority to render truly significant penalties. The Attorney General can prosecute for fraud but rarely does. of the Committee with jurisdiction. Last year, after he made inquiries, an investigator from Iowa State U. was prosecuted. He could be encouraged to “ask” NIH/ORI and the Attorney General why there are not more such prosecutions. I believe that an increase in the number of such well publicized prosecutions could give some investigators second thoughts before they manipulate their data. Derek, what does it take to get more severe sanctions? Well, if you look at the ORI website you will find that in over half of its findings, ORI has imposed debarment from federal funding for a number of years (which is the most severe action that ORI can take – as Don noted, only the federal Department of Justice can prosecute for jail time and fines for crimes). – lifetime (Poehlman 2005, Kornak 2006 [and prison], Sudbo 2007). According to federal debarment regulations, the federal administrative actions are not intended to be “punitive” but instead are imposed to protect the federal interest (i.e., taxpayer dollars) for a given period. It is anticipated that those who are so publicly outed (at least by ORI) for research misconduct will not repeat their bad acts (however, a few have been recidivists in ORI cases, and they were re-debarred (e.g., Lin 2001 and 2004, 3 years each).